There are scattered reports of outdated signs and poll workers providing inaccurate information as Texas holds its first general election since federal courts found the state's voter ID law violated the Voting Rights Act. Nearly a week into early voting in Texas, civil rights advocates say they have received scattered reports of poll workers sharing inaccurate or incomplete information about the state's recently modified voter identification rules, painting a fuller picture of early confusion at the polls. The Texas Election Protection coalition, a combination of several civil rights groups, has received 325 calls since early voting kicked off Monday, representatives told reporters Friday. Many of the calls, which included complaints and requests for information, signaled ongoing confusion about what forms of ID Texans must bring to the polls. In July, a federal appeals court ruled that Texas' 2011 voter ID law discriminated against minority groups, who were less likely to possess one of seven accepted types of acceptable identification. In August, a federal judge ordered a temporary fix for the presidential election: Voters who possess photo ID must show it, but those who don't have — and cannot “reasonably obtain” — it can still cast a ballot. They must sign a form swearing a “reasonable impediment” kept them from obtaining photo ID and present an alternate form of ID. But some Texas polling stations are displaying outdated information. Posters that detail the strict 2011 rules — omitting this year's change — have been spotted this week in parts of Dallas, Hayes, Denton, El Paso, McLennan, Travis and Bexar counties, Kristen Clarke, president and executive director with the Lawyers' Committee for Civil Rights, said in a conference call. "It is shameful we’re now seeing local election officials move forward as if the law were fully intact," she said. Some civil rights advocates said that Secretary of State Carlos Cascos has swiftly responded to such problems. "We went to Secretary of State and said there needed to be statewide action to ensure local officials were told to take [the inaccurate posters] down," said Mimi Marziani, executive director of the Texas Civil Rights Project. "The secretary of state did respond promptly and sent an email out to county officials, and since then we’ve been monitoring the situation. We're pleased to say the Secretary of State's Office has been cooperating." Election lawyers, however, took aim at Bexar County, alleging that local officials have yet to replace all of its outdated voter ID posters, and the Mexican American Legal Defense and Educational Fund filed a lawsuit Friday in Bexar County District Court. It asked a judge to order the county to replace the signs and to update a voice recording on a county election hotline that only details alternative ways to cast a ballot after several prompts and two minutes of recording. Hours later, state District Judge Michael Mery issued such an order. Critics Friday suggested that Cascos' state office should have done more to prepare counties and everyday Texans for the changes. Amid legal wrangling over the 2011 voter ID law, Texas was ordered to spend $2.5 million to educate voters on the issue — a sum that experts say doesn't go far in a state this large. Alicia Pierce, a spokeswoman for Cascos, defended the education campaign, saying that her office's advertisements reach all 254 Texas counties. "If you‘re on Twitter or Facebook today you can see the ads," she told The Texas Tribune. "In addition, the secretary himself is traveling across the state and getting the word out about photo ID requirements, we're engaging with voters on social media and we've emailed out hundreds of digital tool kits to communicate to voters what they need in order to vote." Civil rights advocates also detailed complaints that poll workers — including some in parts of Harris, Travis and Bexar Counties — were telling voters that photo ID was required but not detailing options to cast a ballot with alternative identification. 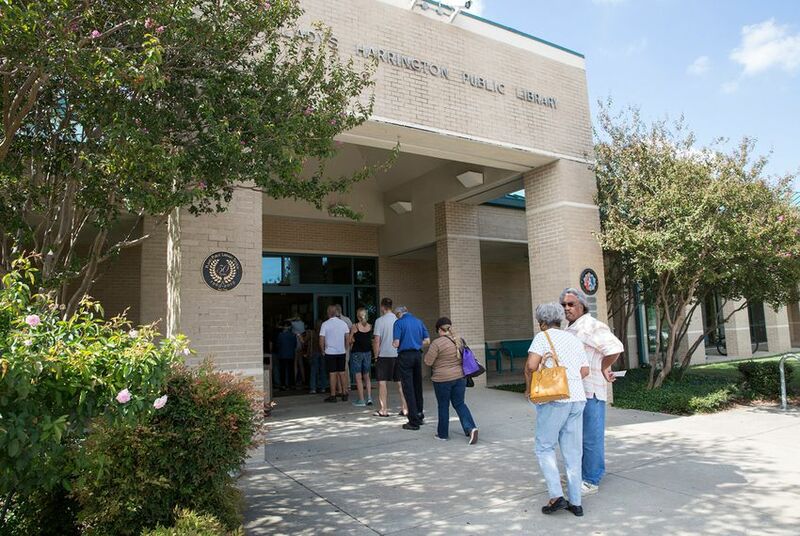 At one Harris County polling place, the group received reports of poll volunteers selectively questioning people of color about whether they were "sure" they were registered to vote. He added that very few people in Texas’ biggest county were signing the “reasonable impediment” form required to vote without qualifying photo ID. At some polling locations, no one had done so after four days of early voting, and at others, a handful or fewer had signed the forms. In Bexar County, a spokeswoman for Callanen also said that poll workers walking lines were trying to speed up the process, and that few had cast ballots without using photo ID. Also in his interview with the Tribune, Stanart appeared to soften his tone on how closely his office would scrutinize each ballot cast without photo ID. In August, the Houston Press reported that Stanart planned to investigate everyone who signed the "reasonable impediment" form — to make sure they weren't lying about not having ID. Seizing on these comments, lawyers accused the clerk of trying to scare away certain would-be voters. But on Thursday, Stanart said he would investigate such votes only if he had "good cause" to believe that a voter was lying. “If we suspect someone is doing fraud – just like if we ever suspect anyone is doing fraud — we will actually investigate it, look at it to see if there’s a real issue of fraud,” he said. Stanart said that he had voters' best interest at heart in raising the specter of such investigations. “I’m trying to protect our voters," he said. "You don’t want to lie on an affidavit, so I just didn’t want our voters to get in trouble." Texas Attorney General Ken Paxton on Friday asked the justices to hear his arguments about why the state’s photo ID requirements for voting do not discriminate against Hispanics and African-American voters.